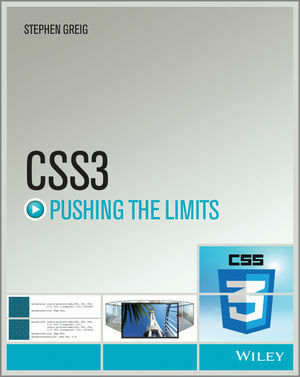 Push CSS3 and your design skills to the limit—and beyond! Representing an evolutionary leap forward for CSS, CSS3 is chock-full of new capabilities that dramatically expand the boundaries of what a styling language can do. But many of those new features remain undocumented, making it difficult to learn what they are and how to use them to create the sophisticated sites and web apps clients demand and users have grown to expect. This book introduces you to all of CSS3’s new and advanced features, and, with the help of dozens of real-world examples and live demos, it shows how to use those features to design dazzling, fully-responsive sites and web apps. Don’t pass up this opportunity to go beyond the basics and learn what CSS3 can really do! Stephen Greig is the author of CSS3 Pushing the Limits, published by Wiley.